I have never seen the White Cliffs of Dover, but my dad, George Edwin Farrar, saw them fifteen times. They were the landmark he and his crew mates would look for as their B-17 crossed the English channel back to the base at Grafton Underwood in England from their WWII bombing missions. It meant that they had survived another one with the 384th Bomb Group and were safe once again. As he told me about it when I was a child, I could see that the beauty was not all in the vision of it, but in the deep emotion of it as well. The White Cliffs of Dover stand 300 feet high and stretch for almost ten miles along the English coastline at the Strait of Dover, facing France and the rest of continental Europe at the narrowest part of the English Channel. They are composed mainly of soft white chalk with streaks of black flint. Interestingly, there are secret tunnels behind the face of Dover’s cliffs that served as Winston Churchill’s military headquarters during WWII. They were originally carved by prisoners held in the Dover Castle during the Napoleonic Wars and later enlarged. 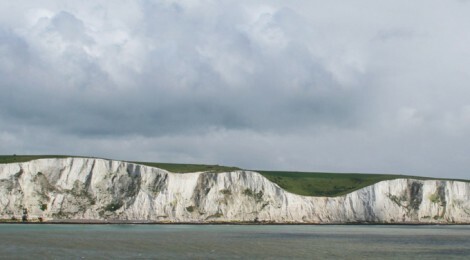 The White Cliffs of Dover are a sentimental symbol of England, which was put into words as song lyrics to the WWII-era song “The White Cliffs of Dover.” It was composed by Walter Kent and Nat Burton in 1941, and recorded by Vera Lynn in 1942. It was written about a year after British and German aircraft had been fighting over the cliffs of Dover in the Battle of Britain, and before America had joined in the war. The lyrics look forward to a time when the war would end and peace would return. While bluebirds, as we in America know them, don’t inhabit England, the bluebirds may have been another bird with a blue sheen. Swallows and house martins migrate to and from the continent in spring and fall, crossing the English Channel over the white cliffs. Many spend the summer in the vicinity of Dover. Traditionally, swallows and martins are believed to bring good fortune. For a nice video with photos of the cliffs accompanied by the song, visit YouTube. George Edwin Farrar and the Buslee crew’s last view of the White Cliffs of Dover from a B-17 was on September 27, 1944 – the 384th Bomb Group’s 200th mission. The next day, September 28, they did not return. By thearrowheadclub in Uncategorized on January 13, 2016 .